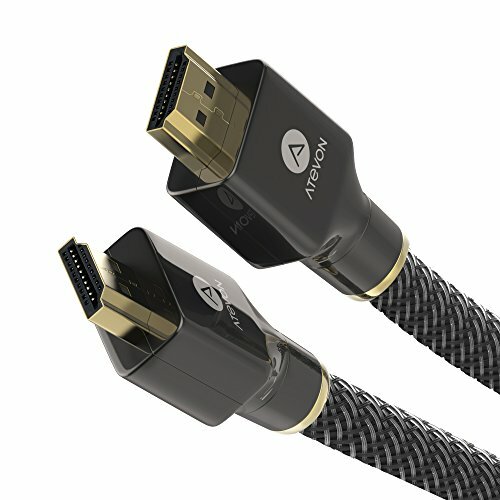 【Multi-functional Support】Atevon High Speed HDMI Cable supports all HDMI 2.0b functions including 18 Gbps, Mirror and Extend mode for your displays, Ultra HD 4K 2160p (up to 60 Hz 4:4:4), HD 2K 1080p (up to 240 Hz), QHD 1440p (up to 144 Hz), HDCP 2.2, 48-Bit Deep Color, Audio Return(ARC), Dolby True HD 7.1 audio and Hot plugging. 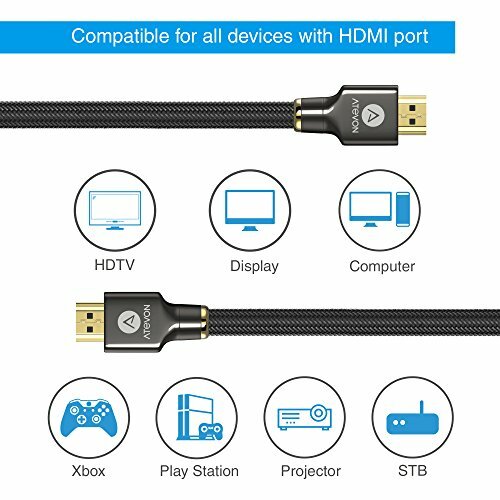 【Universal Compatibility】Superior for all HDMI 2.0 Standards devices as well as being backwards compatible with HDMI 1.4, 1.3 & 1.2. Easily connects your Apple TV 4K, NVIDIA SHIELD TV, CD/DVD/Blu-ray players, Fire TV, Roku Ultra, PS3/4, Xbox One/360, Nintendo Switch, computers, or other HDMI-enabled devices to your 4K/HD TV, monitors, or projectors. Notice: Not compatible with GoPro, Smart Phones, Tablets and Cameras. 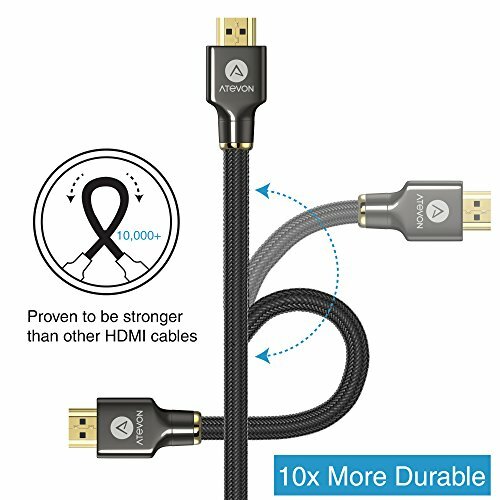 This cable utilizes the latest HDMI standards that supports bandwidth up to 18Gbps to achieve the highest transmission rate, capable of 4K Ultra-HD resolutions. Up to 2160p@60Hz, HDCP 2.2 support, HDR, 48-bit Deep Color, 3D, 32 audio channels, Dolby 7.1, 21:9 video aspect ratio, Multi-stream audio and video on this cable. 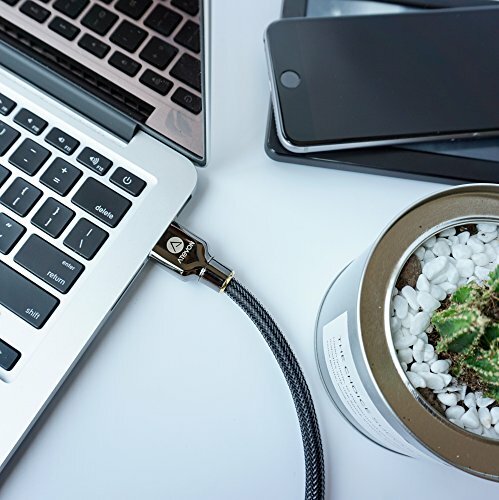 • The HDMI connectors are made of pure copper and gold plated, resist corrosion, provide durability, and improve the signal transmission. • 100% pure oxygen-free bare copper wiring(28AWG) enable 18Gbps speed required for all HDMI 2.0b features. • Copper-Foil wrapped in Zinc-Alloy Shell to achieve better shielding and even lower SNR. • Nylon jacket and Zinc-Alloy casing add both color and durability. 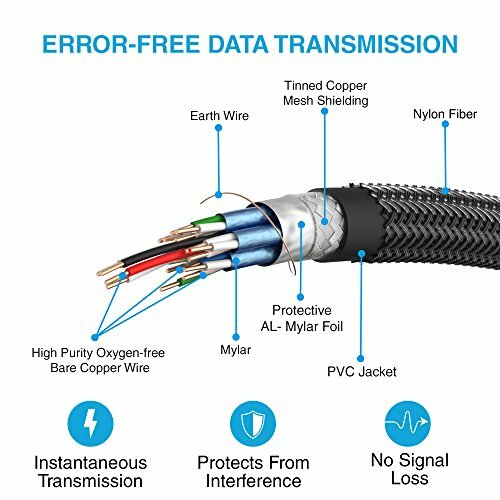 • Triple Shielding Throughout Cable. 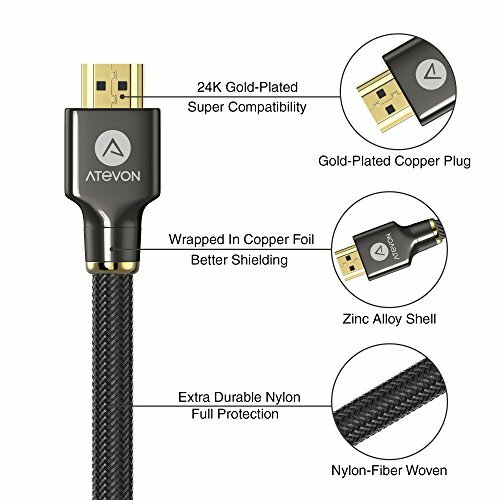 Never mind it’s thicker and tougher than most cables widely sold because Atevon 6ft High Speed HDMI Cable uses more expensive thicker 28 AWG wiring which ensure reliable signal transmission. At Atevon, we believe in our products. That’s why we back them all with an Unconditional Lifetime Warranty and provide friendly, easy-to-reach support. 【Superb Video Quality】Pure copper with 24K gold-plated connectors, high purity oxygen-free copper wiring and triple shielding protect against outside interference and reduces more signal loss, ensure the purity of the digital signal, and provide the truer sound, picture. 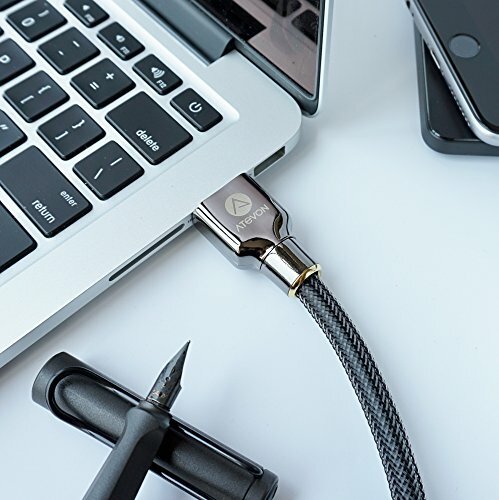 【Ultra Durability】Designed and built with only premium materials ( Zinc-Alloy Shell, durable PVC, high quality nylon fiber cloth jacket), which means this HDMI Cord can withstand at least 10,000 cycles of 90 degrees bend tests and hold up to 10kg. 【Lifetime Warranty】Atevon Unconditional Lifetime Warranty protects your significant investment. We’ll take responsibility for all costs covered during your replacement process. Fast and easy-to-reach Customer Service to solve your problems within 24 hours.